The third of my four installments (here’s one and two of Inktober). And oh boy, get ready for some strange-looking sketches in this one. I tried to use a new kind of pen that has two tips and can make way thicker marks, which has resulted in many many failed drawings and a few semi-successful ones. I present to you the semi-successful ones. (For those interested in drawing implements, I’ve been using a 0.35mm Pigma Micron but this time tried out a Tombow Dual Brush Pen, N15 black). The problems I had with my tools this week, believe it or not, fits thematically with what I’ve been trying to draw: when things break. Or when things (tools) don’t work the way you want them to. What does this have to do with time? 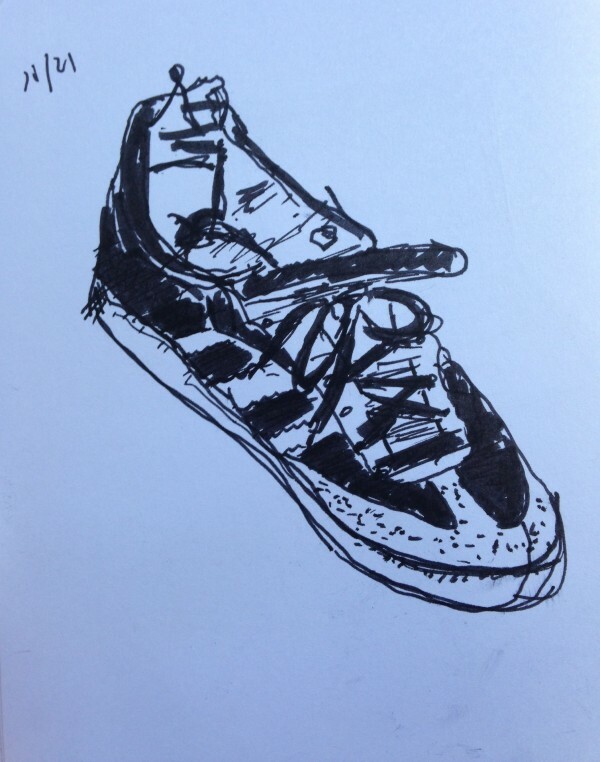 Let’s look at the first picture I’m sharing, a drawing of one of my shoes. You probably can’t tell from what I drew here, but this shoe is thrashed on the inside. The back heel has completely torn through the cloth and this bluish plastic is exposed. There’s also a split starting on the outer-toe area through the leather but I couldn’t really draw it that well. On a side note, looking so closely at my shoe for so long reminded me of this scene from Don DeLillo’s Underworld - from “Sometimes I think…” to the bottom of p. 543 - in which a boy is asked to name as many parts of a shoe as possible. I, in particular, had problems with the vamp. Point being, the shoe is beat, from toe cap to insole. It’s spent. Both of my shoes are. I’ve worn these sambas practically every day since I bought them and often play soccer in them. I will have to buy a new pair very soon. What’s interesting is the way in which I learn that they need to be replaced: I need to buy a new pair because the shoe, as a tool, has “stopped working.” It’s a trigger of some kind that produces an almost automatic response: thing you need breaks? Time to get a new one! Normally, I don’t think about my shoes at all. They’re comfortable and easy to walk in, so they’re just kind of there - they’re “present at hand” (or “at foot”! Ha!). I know they exist, but I’m no more aware of them than I am of my feet, legs, or hips while walking around. That is, until something goes wrong - the felt wears out and chafes my heel; I start to get blisters; the bottom cushioning wears through; the shoe splits at a side. For Heidegger, when a piece of equipment breaks or malfunctions it acquires a new kind of visibility, as though it were semi-transparent before while being used. (If you’re wondering what Heidegger is doing here or want more context, check out my first and second posts). Most importantly, this new visibility changes how and what the thing is - the implication being that situational contexts actually change what things are for us (Dasein) in the world. So when my shoe ‘breaks,’ it changes how it is in the everyday-ness of my world. It stops being a shoe shoe and starts being a trash shoe. Its time is up. 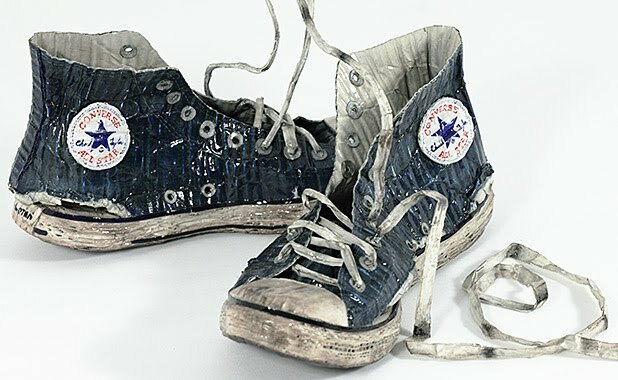 In his 1935 essay “The Origin of the Work of Art,” Heidegger himself actually looks at a famous pair of shoes as an example of how an artistic representation of them can pull together and have the power to disclose a kind of life-world despite simply being ‘equipment.’ And it seems to me that a totally trashed pair of shoes does this very differently than a pair fresh out of the box. So I wonder: when a thing’s lifespan as a thing is over (a lifespan determined in large part by its use context: i.e. a pair of boots that sits in a closet all year vs. pair used by a carpenter or roofer on worksites almost every day), what kind of lifespan does it acquire as something broken? How does the life of a trash shoe different from a shoe shoe, assuming that it’s possible these two shoes might be different things for me? An illustrative example would be something like comparing how we think of the ‘lifespan’ of a car battery with the ‘lifespan’ of a dead car battery: the first has to do with human use, the possibility of travel, cold winter mornings, brand reliability, maintenance, usually a matter of years; the latter with molecular half-lives, recycling practices, landfills, all on a much longer scale. So two main questions: on the one hand, how do we conceive of time passing for things that are ‘invisible’ and ‘present-at-hand’ - things that are there in the background almost all the time, but that we take for granted until lost or broken? 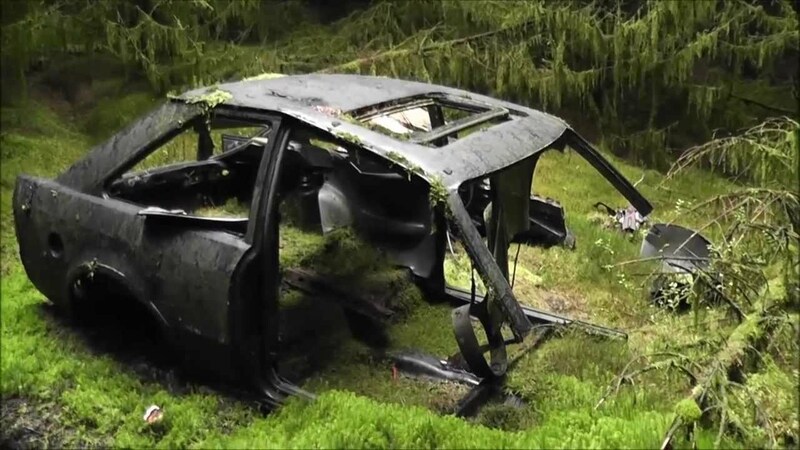 And on the other, how do we conceive of time passing for things that are out of sight and mind - things that have been cast aside, like this car is now, or my shoe soon will be? 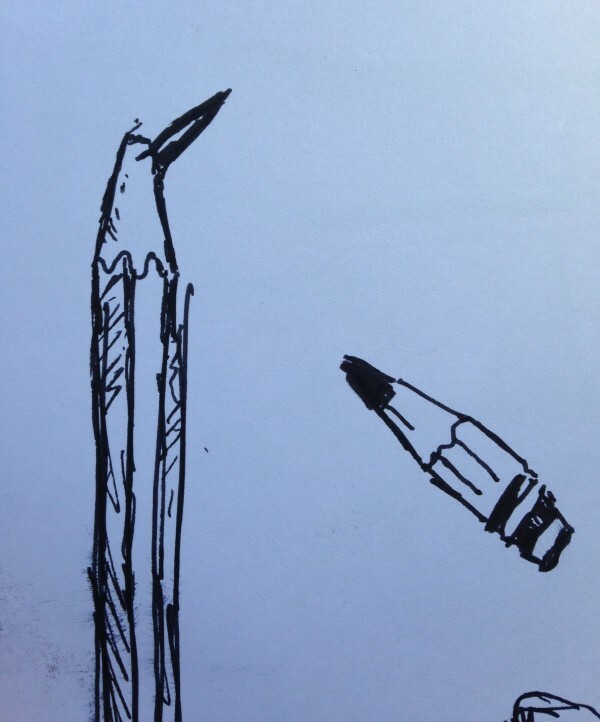 One more: a pencil with a broken tip, and a pencil that has been sharpened way past its point of practical usefulness. Sometimes when things break, when their ‘time is up,’ they acquire a certain kind of urgency. They come to the fore. It’s almost like they come back into existence from some kind of constantly humming background noise. All of the sudden you have to decide what to do with this thing - do you fix it? Replace it with something else? Replace it with a new version of itself? Leave it in the weeds (or the center of the Pacific)? These questions may feel simple, or perhaps too straightforward, but they are the kinds of questions that matter for Daisen (us, humans, beings for whom being is a question) when it comes to things in our world. And because they matter to us in this way, these questions matter for how these objects are _or _are not in our worlds - and by world I mean the highly contingent world with which a given person is familiar and in which they live their day-to-day lives, one that is changing all the time. 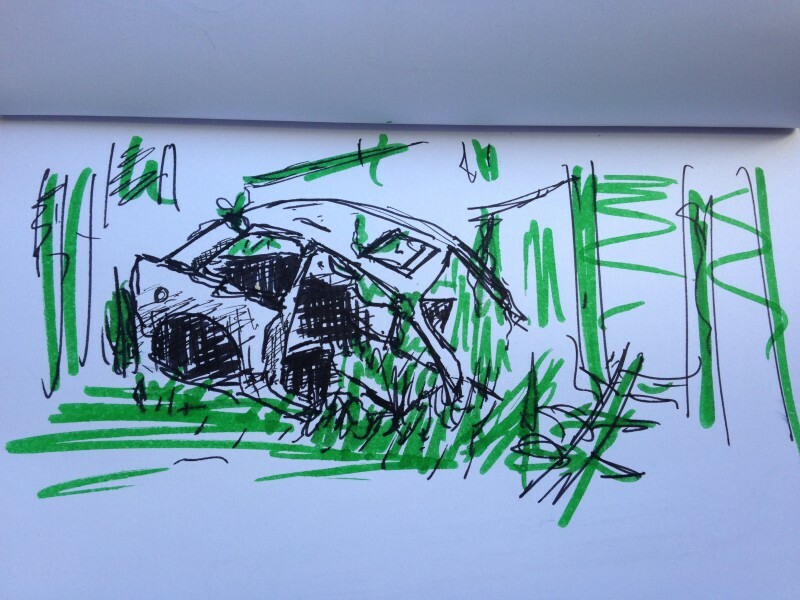 I’d like to think more on just how my busted shoe, the car in the weeds, and the too-short pencil go about ‘remaining’ in the world, and how this might differ from their still-in-use counterparts. Cite this post: Ethan Reed. “Inktober 10/21: When Things Break”. Published October 28, 2015. https://scholarslab.lib.virginia.edu/blog/inktober-1021-when-things-break/. Accessed on .